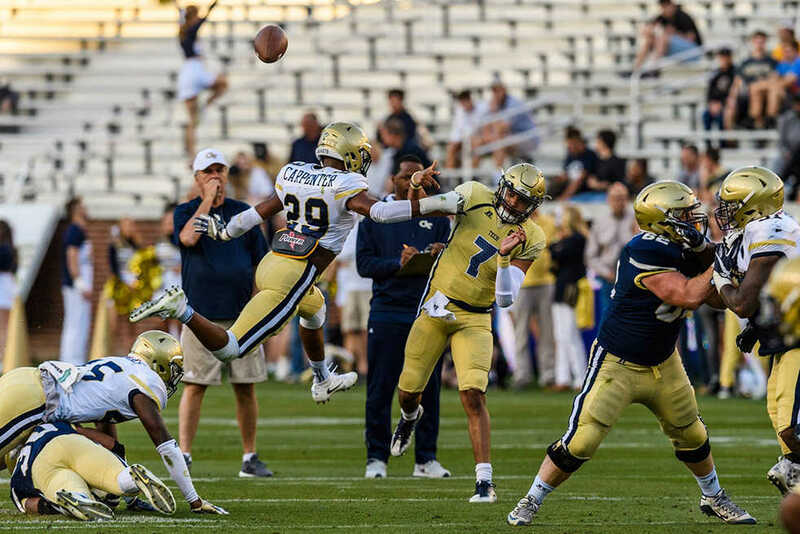 The annual Spring Game came on the heels of a training season where the Jackets looked to improve the aspects of their game that led to a sub-par regular season. Two new, yet unrelated, aspects that made their mark before the fall season were Nate Woody’s arrival from Appalachian State to take on Ted Roof’s former position of defensive coordinator, along with the first implementation of Tech athletics’ new clear bag policy. The game resulted in a blue team win over the white team with a score of 24-14, as well as a few takeaways to help guide the Jackets and their coaches into the upcoming year. The most notable part of the game was the lineup of players on the field. The majority of the key players that head coach Paul Johnson will look to for leadership were on the sidelines cheering on their respective teams for a variety of reasons ranging from injury and sickness to family events. Some of the players not actively participating included starting quarterback TaQuon Marshall, guard Parker Braun and safety A.J. Gray, the latter of which will have to sit out his last season due to a heart condition. The Jackets will rely on the older players to make key plays during regular season, so thankfully the only player that will miss significant time is center Kenny Cooper following lower body surgery earlier this year. In order to make the spring game run smoothly, Johnson placed Jahaziel Lee in Cooper’s position as first-string center. Lee typically plays left tackle, but Cooper has not had much backup in the past and could be looking to Lee in the event that his surgery recovery takes longer than expected. Similarly, the rest of the offensive line on both teams lacked depth during the game, relying mostly upon freshmen talent from offensive linemen Hamp Gibbs and Connor Hansen on the white team and Zach Quinney and Charlie Clark on the blue team. The showdown for second-string quarterback between Lucas Johnson and Tobias Oliver will be something to keep an eye on in the fall. Both players had their fair share of missed throws, but both also have outstanding athletic ability that will serve them well over the next few years as they follow in Marshall’s footsteps. Senior A-back Clinton Lynch appeared to be back and better than ever after knee surgery about a year ago and an injured hamstring last season, which is good news for the rest of the team. Lynch’s contributions to the blue team consisted of 3 carries for an accumulated 28 yards, along with a reception that resulted in a 33-yard touchdown. The Jackets can count on Lynch to continue to bring a resilient attitude as he strives to top the stats he put up during his freshman and sophomore years. From a defensive perspective, things looked different for the Jackets as they ran the new “attack-style” 3-4 defensive alignment that Nate Woody favors. The problem with this style is that the current defensive Tech players were recruited with the old 4-2-5 alignment in mind, which means that players will be shifted around to find the position that suits them best with the new defensive coordinator. Several transfers such as defensive back Malik Rivera, long snapper Zach Roberts and offensive lineman Jack DeFoor did not have the chance to play in the game, but will be expected to be active in future games. Special teams involvement was kept to a minimum as zero kickoffs were performed during the scrimmage, yet punter Pressley Harvin and kicker Brenton King were able to play for both teams and show their skills. Harvin’s best punt had a hang time of 4.6 seconds according to myajc.com, while King was 5-for-5 on extra point attempts. Overall, the Jackets seemed to be off to a relatively good start after a long season of spring training. The missing players definitely threw the coaching staff for a loop when trying to assign positions and establish leadership for both teams, but the Jackets should be back in full swing by the time regular season rolls around. With a strong senior squad including captains TaQuon Marshall and Brant Mitchell, the younger players will have experienced role models that will expect the team to perform at their best amongst a consistently tough conference. The Jackets will open their upcoming 2018–2019 season against a team that lies in another conference, Alcorn State, at home in Bobby Dodd on September 1 before competing against in-conference rivals such as Clemson and Pitt on national television later in the season.